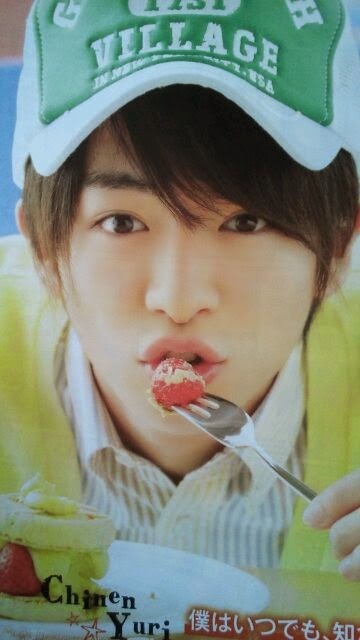 Chinen Yuri is the youngest member of Hey Say JUMP. Born in Shizuoka November 30, 1993. His parents called him Yuuri because they want a name sound both like a girl and a boy. Yuri has an older sister who 2 years older than him. Yuri's mom and his older sister are Sakurai Sho's fans and he was influeced by them. Yuri was in same audition as Daiki (June 2, 2003). Yuri started dance when he was 3 years old. Yuri started gym & acrobatics at such a young age but he started to get bored of gym & acrobatics, and didn’t want to practice when he was in years 1. JUMP members never went to his home. Yuri moved to tokyo when he was started middle school becouse of his father job. Back then Yuri even called Ryosuke "Kaba-chan" but Ryosuke was like “Hey, I’m gonna get angry at you” but he'd still call him “Kaba-chan". When he saw Ryosuke on TV, he wanted to dance with him. He actually didn't really want to go to high school, but at the end he still did it becouse he think about his fans. Yuri was in the same class as Yuto the whole time in high school. Yuri best subject was World History becouse he was good with memorizing, and his worst subject was English. He can get it why he must learning English since he's a japanese and live in Japan XP. Yuri said he would prefer JUMP not to make speeches or congratulate him on his wedding cos he will feel awkward. One time, Ryosuke was crying and Yuri saw him, Yuri walked to him without saying anything and cried along with him. Yuri's ideal girlfriend is someone who cheerfull, grace and fashionable. He prefer called Yuri by his girlfriend. His first love was during 1st year in elementary with the girl in the same class as him. He's considered Okamoto Keito as someone who good to hang with. He's considered Nakajima Yuto as a friend. He's considered Yamada Ryosuke as boyfriend partner XD. He's considered Yabu Kota as oniichan (older brother). He's considered Arioka Daiki as someone you don’t feel like is older than you *poor daichan XP*. He's considered Yaotome Hikaru as someone who I learn something new from. He's considered Takaki Yuya as someone 'if you get closer and you’ll know he’s kind'.